Attorney Jim Knappenberger offers a full range of legal services to individuals and businesses throughout the greater Eastern Missouri area including St. Louis City, St. Louis County, St. Charles County, Franklin County, Jefferson County, Warren County, Lincoln County, Gasconade County and other counties throughout Eastern Missouri. 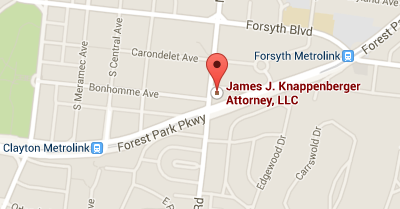 Contact an experienced St. Louis lawyer committed to your legal needs. Call attorney Jim Knappenberger today to schedule a FREE initial consultation without obligation and learn how the law applies to your specific situation.